This has shaped up into a regular bout between Superman Red and Superman Blue. As ComicsAlliance recently reported, Dwight Howard starred in a new ESPN commercial emphasizing the Orlando center's persona as the NBA's resident Superman. This apparently rankled some Shaq-tastic feathers, as Cleveland center and 4-time NBA champion Shaquille O'Neal asked reporters, following a Cavaliers defeat of Orlando just prior to the All Star break, "You tell me who the real Superman is?" O'Neal went on to suggest that he had "invented" everything Howard had done, according to Yahoo Sports. Howard responded badly to the accusations of biting The Big Aristotle's style, and, despite an attempt to diffuse the beef during All Star Weekend, a mini-controversy erupted. Then, just this past Sunday, the two teams squared off once more. This time it was Howard who came out on the winning side, and secured his stake in the Super-title for at least another day. 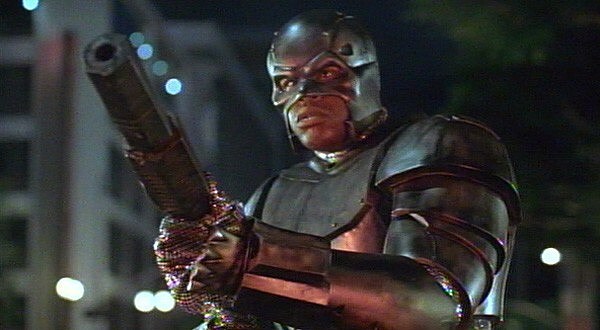 But which NBA giant is really closer to being a real life Metropolis Marvel? As Lex Luthor might put it, just who is Superman? Check out how ComicsAlliance's tale of the tape measures the Super-feud after the jump. Choosing between these two worthy superstars is no easy task. In order to decide who deserves full custody of the legendary S-shield, we've taken a comparative look at just what makes Superman who he is. While neither has revealed any aptitude for X-ray or heat vision, or freeze breath, for that matter, each player makes a worthy case for inclusion in the House of El. Reasoning: Howard's ascension to superhero status came out of his much celebrated 2008 Slam Dunk Contest victory, in which he donned the cape and tights and took to the skies. Dunk contests routinely showcase unbelievable athleticism, but rarely is a player of Howard's considerable stature able to compete with the comparatively shorter, more rangy swing players that typically dominate the contest. 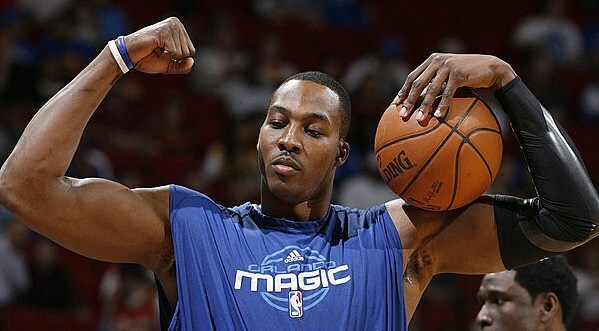 Almost the size of a building himself, Dwight's got the power of flight. Reasoning: When it comes to defending justice, Shaquille O'Neal puts his money where his mouth is. Shaq has long dabbled in the art of law enforcement, serving as a reserve officer for Miami Beach and the Los Angeles Port Police. He has acted in an official capacity as an advocate for Internet safety among youths, and in 2006, told ABC News, "I have full powers of arrest." 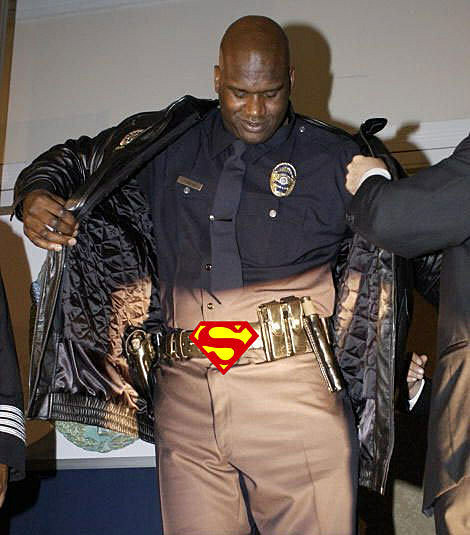 Not even Clark Kent has a greater ability to protect innocents during his day job than Shaq. Reasoning: Even Shaq himself would cop to this one, just this week telling the Associated Press, "Dwight is one of the only true big men left." As the NBA becomes more predicated on speed and outside shooting, powerful, lumbering "true centers," become less and less common. This makes Howard, who has plenty of speed but is fundamentally an "inside" player, the last of a dying breed. He wasn't sent here on a rocket or anything, (as far as we know), but this still gives him "Last Son," status. Reasoning: Power has always been the key to Shaq's success. The self described "M.D.E." 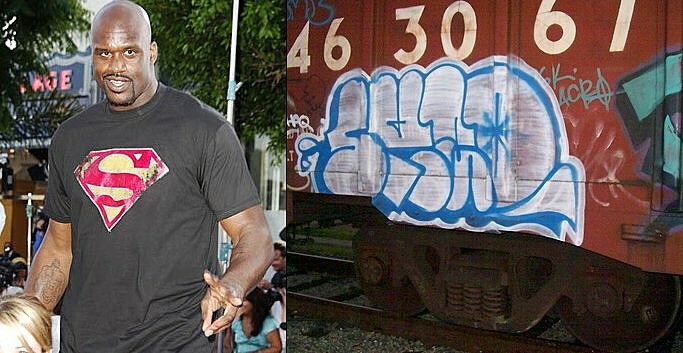 (that's Most Dominant Ever, for you vo-Shaq-ulary n00bs), gained widespread notoriety early in his career by dunking with such ferocity that he more than occasionally shattered backboards. His strength was unparalleled, and his combination of power and size, not just height, but size, was what set him apart from his peers. He wasn't just strong, he was Silver-Age strong. 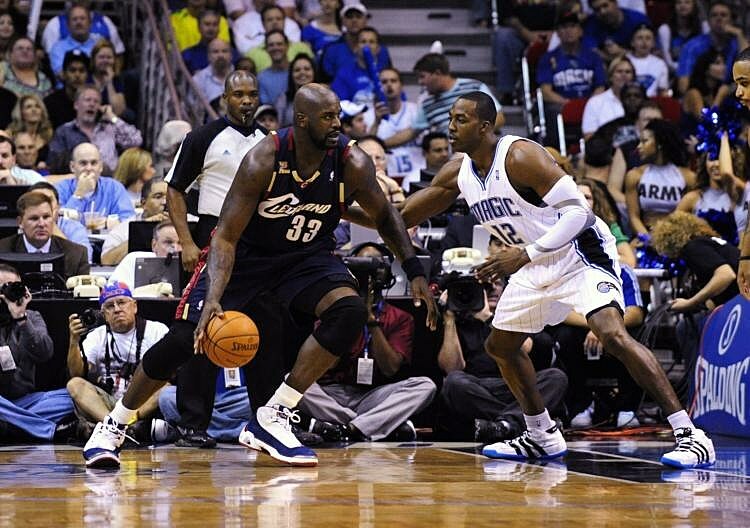 Reasoning: Not even Shaq can overpower the effects of time. And while O'Neal has played seventeen years of outstanding ball, his best days on the court are behind him. Howard, however, has plenty of Tomorrow to look forward to. Drafted to the pros as a teenager straight out of high school, and then leading the Magic to the NBA Finals last season, the twenty-four year old Howard is surely basketball's prototypical center of the future. Sure, it's a cop-out, but if DC Comics doesn't have to settle on just one iteration of Superman, why should super hero-inclined NBA fans? In the comics' realm, creators reinterpret the Superman mythos every few years, tweaking bits and pieces here and there to keep the character sufficiently modern and relevant. It is important to maintain the vitality of the character. Well, the NBA is also full of characters and personas that are constantly evolving, and during that evolution there is bound to be some crossover, (and that's crossover as in intersection; not crossover as in hand-changing dribble, or crossover as in publishing line-wide event storytelling). 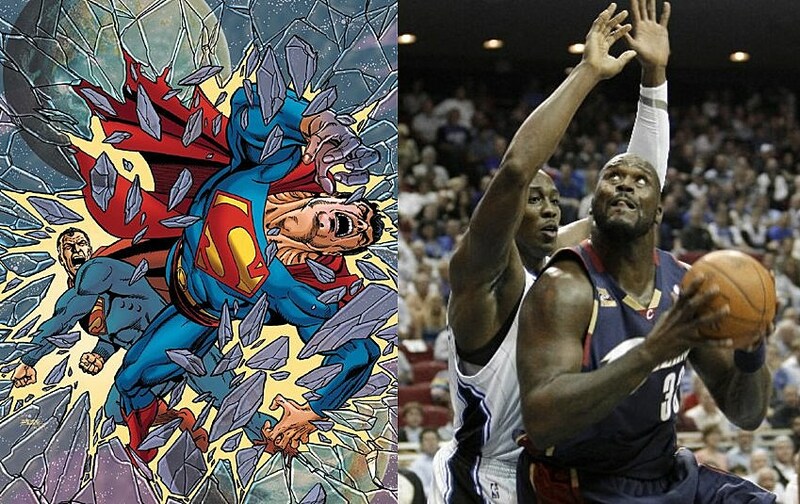 So in the end, it goes something like this; Shaquille O'Neal is the Golden Age Superman. He was the first of his kind; he was unrivaled in his grandeur, and he wore the "S" with distinction. 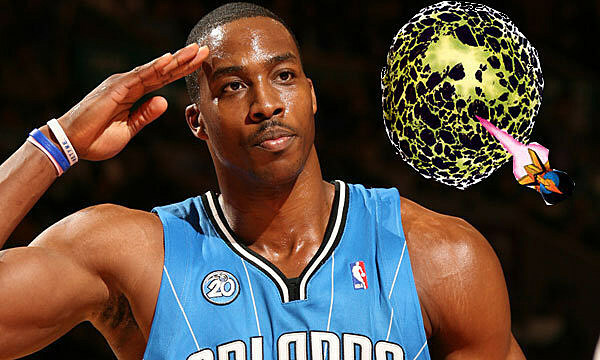 Dwight Howard is the modern day Superman. He is sleek and streamlined; he is less original, less accomplished, but possesses the power to inspire current and future generations. One's great strength is his history. The others' is his potential. So rest easy, Metropolis. Your protection is in good hands. So long as, y'know, the two Supermen don't destroy each other or anything.